Brexit. Most people, apart from the zealots, are by now thoroughly bored by the topic. It’s become like watching an incredibly dull film that you are half way through - you can’t switch off in the vain hope that it will get better by the end. As investment managers, we are paid to try to divine what the implications might be for investments. So, what do we know? Well, we are leaving the European Union, which will have many consequences. The most ‘quantifiable’ outcome currently is “no deal” (which would see the UK leave the EU and the customs union) because we already know the economic rules that will apply and the societal impacts such as the loss of the automatic right to work or live in Europe Union. The more unquantifiable option is some form of trade deal with the EU which, although likely, is unclear. So, what does trading under the World Trade Organisation (WTO) rules mean? The WTO consists of 164 members that together account for 98% of all global trade. Their aim is to reduce all barriers to trade by acting as a forum and dispute resolution for countries to constantly re-negotiate to remove the blocks they have on trade. These include both tariffs (taxes) on products/services as well as non-tariff areas such as packaging or licencing that can be used to frustrate trade and their decisions cannot be overruled by a member’s national courts - such as the European Court of Justice. It should be remembered that the UK already trades with many countries under WTO rules such as the USA, China, Australia and New Zealand and their goods can be currently bought on eBay, Amazon and in our shops. Generally, countries apply the highest tariffs on the industries that they want to protect from competition, or if they feel the foreign competition has an unfair advantage such as state subsidies or avoiding environmental standards. In Europe’s case the highest tariff products are food, clothes and shoes which makes these 3 product groups more expensive to import into the region, raising their prices for consumers thus making products from outside the EU less attractive. If we leave the EU and revert to trading under the WTO rules, the general tariffs on most manufactured goods between the UK and EU are quite low, averaging around 3%. The key areas that have higher tariffs are automobiles and services in addition to agriculture, clothing and shoes. Without a deal, farmers for example, would find it more difficult to export to the EU and car manufacturers and other services would need to relocate their manufacturing, offices and jobs (and UK citizens would no longer have the automatic right to work in Europe) into the EU to avoid these tariffs and vice versa for European companies. The net effect, in the short term, would be negative. If we leave the Customs Union, then the UK will be able to pursue its own trade deals and many non-EU countries that have trade deals with the EU have said that they would offer the UK the same terms as currently offered to the EU. It is undeniable that the EU is our largest trading partner accounting for 48% of exports in 2016 valued at £235.8 billion. Whilst this is a huge market, its share of our exports has fallen from 54% since 2000 despite the expansion of the EU. 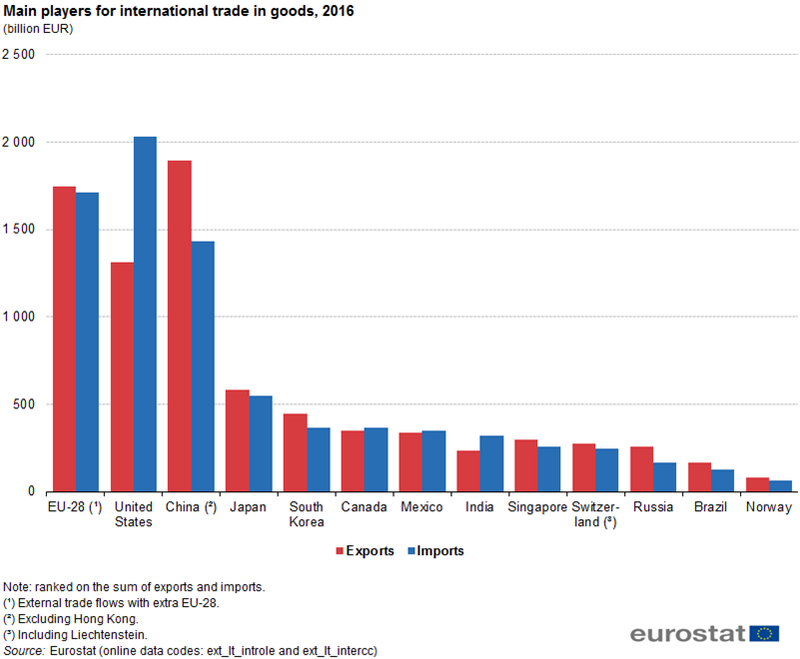 On the flip side of the equation, the UK imports some £318 billion from the EU making it one of their larger export markets and it’s interesting to note that, just like the UK, some of the EU’s largest trading partners (USA & China) currently operate under WTO rules. The key question, under the WTO scenario, is whether the UK can replace the lost trade and jobs from leaving the EU with business from new markets and across what timescale. 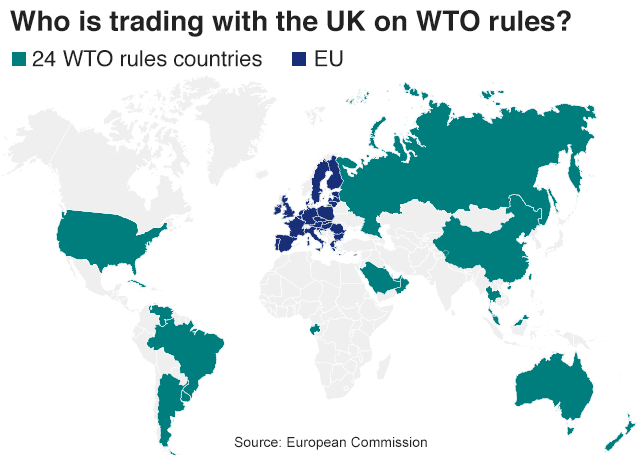 “Remainers” tend to dismiss the WTO as an option but the evidence suggests that, after any shorter-term adjustments, it is viable as both the UK and the EU use these rules currently for significant markets. “Brexiteers” seem to dismiss the shorter-term adjustments and highlight that because 90% of World GDP growth in the coming decades is expected to be outside the EU, it is vital that we can look beyond the EU. Politicians sit the middle. In summary, the future currently remains unquantifiable as a post Brexit trade deal is still probable although the terms remain unknown. Our response as investment managers has been to reduce UK equities in favour of international shares and hold a broader basket of currencies. We would accept that the UK looks cheap and that the prospect of selling our highly valued US shares, trading in an expensive US dollar relative to sterling, to buy cheap UK companies is looking compelling. This could be an opportunity worth pursuing as the uncertainty lifts.